This short celebrates silence, specifically, Maggie's: her 'performance', if you will, is Chaplin-esque. I'm a dedicated Simpsons fan. I watched the original Tracey Ullman Show shorts and the premiere of Simpsons Roasting on an Open Fire, as well as 2007's The Simpsons Movie and all the episodes in between. I know what The Simpsons does well, what it's inspired, and where it's fallen off, I admire its wit and appreciate its ambition. And I know that at its heart, The Simpsons is about a family: Homer and Marge and the children love each other, and that's why we love the show. This idea isn't immediately visible in Maggie Simpson in 'The Longest Daycare', a five-minute, theatrically released short film. 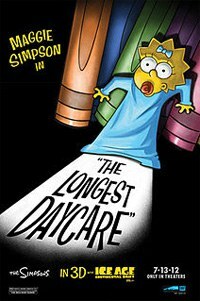 The first Simpsons property to be nominated for an Academy Award (Best Animated Short in 2013), the piece follows Maggie on her own at scary daycare. A silent movie with music by Hans Zimmer and James Dooley, The Longest Daycare is, in the end, also about the family finding its way in a chaotic world. The story opens as Marge drops off her forever-infant daughter at the Ayn Rand School for Tots. Maggie must pass through airport-style security screening and a brain scan en route to the “Nothing Special” section. Here she's confronted by her archenemy, “the one-eyebrowed baby” Gerald. Introduced in The Simpsons' 100th episode, Baby Gerald has made sporadic appearances in the series since 1994, mainly so that he and Maggie can glare and shake their fists at each other. In The Longest Daycare, the babies face off more vigorously. Their battle is rendered in animation that's both sharp and beautiful. The rich light on Maggie showcases her optimistic innocence, set against the creeping darkness of the school's scariest corners, as Gerald and Maggie chase each other through classrooms. The 3D theatrical version of the film uses the technology to make fun of it, as a swarm of angry lice flies at the audience or a pop-up book's pages pop forward. The TV version is 2D, which makes clear the joke at the expense of such 3D gimmickry. The Longest Daycare celebrates TV, and specifically, The Simpsons, reminding us how smart its visual details can be. Maggie's pop-up book bears the name Goodnight Cocoon, as she rescues an endangered caterpillar, and she's surrounded by a line of Raggedy Ayn Rand dolls that adorn the playroom. The short also celebrates silence, specifically, Maggie's. Her performance is Chaplin-esque, as she squares off against sinister Baby Gerald, intent on protecting her newest friend, the caterpillar. This performance recalls classic Looney Tunes and Merry Melodies shorts, too: her swooning, her hands clutching her chest and emptily clawing at the air while the music swells and she falls to her knees evoke Wagnerian moments between Bugs Bunny and Elmer Fudd. The Longest Daycare makes spoofy use of "Vesti La Giubba" from I Pagliacci over Gerald's dark visage. The short isn't the TV series, but it does underscore what makes The Simpsons special. If the series competes weekly with a slate of animated primetime sitcoms it inspired, trying to match the edginess of Family Guy or the anything-goes comedy of Bob's Burgers, the The Longest Daycare uses Maggie's silence to reinvent the sort of irreverent comedy and affable charm that has made the series so enduring.